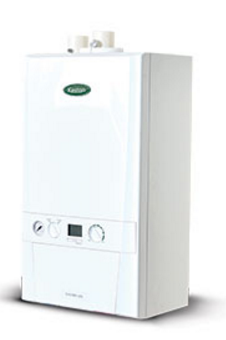 The Kenston C30 is a wall mounted combi gas boiler. This boilers compact size means that you can place it anywhere in your house, it has a height of 700mm, width of 395mm and depth of 278mm, so it will even fit in a standard sized cupboard! The Kenston C30 is also a lightweight boiler and has a 50mm muPVC solvent to allow for a simple cost effective installation. It comes with a Kenston twin-flue system that can be placed anywhere up to 27 metres from the flue outlet - another great way it can be flexible in your home. This boiler comes with many different features to help its reliability such as a low component count to maximise reliability. It also has a large backlit display that has easy to use controls, and easy to see pressure gauge, as well as a pre-fitted filling loop automatic bypass. This boiler has built in frost protection to help protect your boiler from any weather thrown your way. As well as this it comes with a 2 year warranty and is also available in the output of 35kW.